Recent reports have highlighted that India’s planned defence procurement from Russia could potentially come under US sanctions under a newly enacted law, Countering America’s Adversaries through Sanctions Act (CAATSA).1 The Act, if implemented in its extreme form, has the potential to adversely affect India’s defence purchases from its traditional partner, Russia, besides putting to test India’s growing defence and security relations with the United States. This Brief examines CAATSA and its likely implications for India’s defence and security cooperation with two of its main arms suppliers, Russia and the United States. CAATSA was passed overwhelmingly by the US Congress and signed reluctantly by President Donald Trump.2 Enacted on August 2, 2017, it aims to counter the aggression by Iran, Russia and North Korea through punitive measures.3 Title II of the Act primarily deals with sanctions on Russian interests such as its oil and gas industry, defence and security sector, and financial institutions, in the backdrop of its military intervention in Ukraine and its alleged meddling in the 2016 US Presidential elections. Section 231 of the Act empowers the US President to impose at least five of the 12 listed sanctions — enumerated in Section 235 of the Act — on persons engaged in a “significant transaction” with Russian defence and intelligence sectors. Two of the most stringent of these sanctions are the export licence restriction by which the US President is authorised to suspend export licences related to munitions, dual-use and nuclear related items; and the ban on American investment in equity/debt of the sanctioned person. Some other sanctions, which are of not much relevance to India, include restriction on US Export Import Bank assistance; prohibition on loans from international financial institutions; exclusion from participation in US government procurement; and visa restrictions on corporate officers of the sanctioned entities. Subsequent to the enactment of the Act, the US President has delegated his powers to the Secretary of State to implement Section 231 in consultation with the Treasury Secretary. As part of Section 231 of the Act, the Department of State has notified 39 Russian entities, dealings with which could make third parties liable to sanctions. These include almost all of the major Russian companies/entities such as Rosoboronexport, Almaz-Antey, Sukhoi Aviation, Russian Aircraft Corporation MiG, and United Shipbuilding Corporation which are active in manufacturing defence items and/or their exports. The list also includes a few entities from the intelligence sector (Table 1). Note: Names in Sl. Nos. 1-33 and Sl. Nos. 34-39 are of defence and intelligence sectors, respectively. India faces one of the most complex security environments in the word that spans the full spectrum of conflict from nuclear to sub-conventional war, and the possibility of a two front war. Apart from cross-border terrorism and growing radicalisation in its immediate and extended neighbourhood, India’s security landscape is challenged by the unresolved border disputes with Pakistan and its ‘all-weather friend’, China. Between these two traditional rivals, it is China which is increasingly becoming unpredictable for India’s security calculus. China’s increasing military activism under its life-time president, supported by an unpreceded increase in military spending — which has made it the second largest military spender in the world — is of particular concern to India. Its military assertion, including recently in Doklam, and growing military encirclement of India through land- and sea-based infrastructure networks in the Indian Ocean Region, pose a grave challenge to India in the foreseeable future. While importing arms, India has, since independence, followed a policy of diversification, which has led it to source weapons from more than two dozen countries. Nonetheless, the Soviet Union (and later Russia) has been the main source of India’s arms imports since the 1960s when India first signed the MiG-21 fighter deal. Other significant suppliers of arms include the UK, France, Israel and the United States. Among these, the US has, in particular, been quite successful in bagging multi-billion dollar arms contracts in recent years, thanks to the 2005 India-US nuclear deal, in which US defence contractors “played a part” in passing a key legislation in the US Congress.10 Between 2013-14 and 2015-16, the US has won 13 contracts worth Rs 28,895 crore ($4.4 billion). Both in term of the number and value of contracts, the US is way ahead of other major suppliers (Table 2). In percentage terms, the US share of Indian arms imports total 23 per cent in terms of the number of contracts and 54 per cent by value. Source: Standing Committee on Defence, Demand for Grants 2017-18, 31st Report, p. 29. Since 2008, the US has bagged more than $15 billion in arms deals including for the C-17 Globemaster and C-130J transport planes, P-8 (I) maritime reconnaissance aircraft, M777 light-weight howitzer, Harpoon missiles, and Apache and Chinook helicopters.11 This value is all set to increase further with the US likely accepting an Indian request for Sea Guardian drones. In addition, US defence contractors, including Lockheed Martin and Boeing, are also strong contenders for a number of high-profile arms deals, including the recently floated tender notices for 110 fighter planes for the Indian Air Force, 57 Multi-Role Carrier Borne Fighters for the Indian Navy, and 234 naval utility and multi-role helicopters. The success of the US, and also Israel to a large extent, in the Indian arms market has its effect on Russian supplies, though Moscow still remains India’s predominant defence supplier. 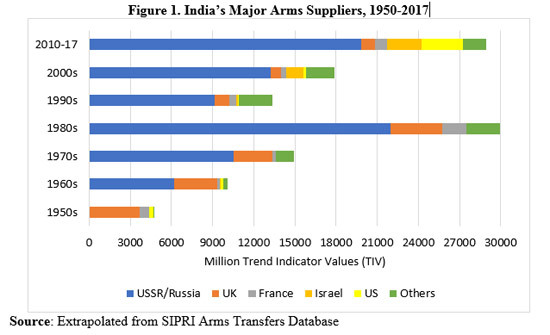 As per the Stockholm International Peace Research Institute (SIPRI) Arms Transfer Database, during the period 2010-17, Russia was the top arms supplier to India, with total deliveries amounting to 19.8 billion Trend Indicator Values (TIV),12 followed by the US (3.05 billion TIV), and Israel (2.5 billion TIV). In percentage terms, however, the Russian share in India’s arms imports during the same period has declined to 68 per cent, from an all-time high of 74 per cent during the 2000s, whereas the combined share of the US and Israel has increased from nine to 19 per cent. Between 2013 and 2017, Russia’s share declined further to 62 per cent, whereas the combined share of US and Israel increased to 26 per cent.13 Accounting for about 15 per cent, the United States is the second biggest supplier of arms to India during the five year period ending 2017. Between 2000-2009 and 2010-17, US arms deliveries to India have increased by a whopping 1470 per cent. Figures 1 and 2 portray the summary of India’s main arms suppliers and their share since the 1950s. Behind the curtain of Russian dominance also lies the criticality of India’s defence preparedness and indigenous manufacturing. It is needless to say that the bulk of the potent weapons in India’s arsenal are of Soviet/Russian origin and that some of these are not available for purchase from any other source, even for love of money. The nuclear submarine INS Chakra, the Kilo-class conventional submarine, the supersonic Brahmos cruise missile, the MiG 21/27/29 and Su-30 MKI fighters, IL-76/78 transport planes, T-72 and T-90 tanks, Mi-series of helicopters, and Vikramaditya aircraft carrier are all sourced from India’s traditional Cold War partner. Similarly, from the point of view of indigenisation and self-reliance efforts, which are being reinvigorated through the present government’s Make in India programme, Russian technologies constitute the mainstay of India’s licence-based manufacturing. CAATSA, if implemented in its stringent form, is likely to affect India’s arms procurement from Russia in a number of ways. First, India’s planned procurement from Russia, particularly the S-400 air defence system, Project 1135.6 frigates and Ka226T helicopters, will come under the immediate scanner of US authorities, as they are mandated to deter exports of key Russian defence entities. In all likelihood, US authorities will try to influence their Indian counterparts to ignore the Russian platforms, though it is entirely up to New Delhi to make its own judgement. Second, CAATSA is likely to affect all the joint ventures (JVs) – existing or planned — between Indian and Russian defence companies. Some of the existing JVs that may come under the scanner are: Indo Russian Aviation Ltd, Multi-Role Transport Aircraft Ltd and Brahmos Aerospace. Third, the Act will also affect India’s purchase of spare parts, components, raw materials and other assistance for which Indian entities are dependent on Russia for domestic licence manufacturing and maintenance of existing equipment. CAATSA has the potential to heighten India’s traditional insecurity about the United States as a reliable partner, and sour New Delhi’s defence and security cooperation with Washington at a time when the US is projecting India as a key partner in its Indo-Pacific strategy, with the US National Security Strategy 2017 explicitly supporting New Delhi’s vital role in this regard.14 The biggest question therefore is how and to what extent CAATSA is going to affect India-US defence and security cooperation. It all depends on how lightly or stringently CAATSA provisions are imposed. Apart from the standard waivers that the US President enjoys on the grounds of national security interests, there are plenty of conciliatory remarks from higher American authorities, which indicate that Washington may take a lenient view of CAATSA in regard to India’s defence cooperation with Russia. For instance, Admiral Harry Harris, Commander of the US Pacific Command, referred to a classified letter written by Secretary of Defense James Mattis to the concerned members of the Senate Committee on Armed Services, wherein Secretary Mattis has requested for “some relief from CAATSA” for countries like India.15 In his argument, Admiral Harris has also favoured relief citing the “strategic opportunity” that India presents to the US and also the opportunity “to trade in arms with India.” Other senior US defence department officials have also made similar statements favouring the adoption of a lenient view for India’s defence procurement from Russia. The conciliatory remarks from high US officials are not surprising given that the sanctions on India or any of its entities and persons will bring bilateral defence cooperation to a halt, as the Indian Ministry of Defence will not be able to engage its US counterpart, including on arms trade that Admiral Harris was referring to. That, in turn, would force India to reverse its declining arms dependence on Russia, while arresting the upward trend in India-US defence trade. More importantly, any US sanctions on India will be counterproductive to America’s own strategic interests vis-à-vis China. Needless to say that an adversely affected Indian defence posture will end up tilting the military balance in favour of China, whose military assertion in the Indo-Pacific region bothers both Washington and New Delhi. The ban on equity/debt investment will place in jeopardy the Joint Ventures that American defence companies have formed with Indian companies in recent years. Moreover, American companies will be barred in the future from forming any Joint Ventures with their Indian counterparts to take part in several mega procurement contracts that the MoD is aggressively pushing through its newly announced Strategic Partnership (SP) model as part of its Make in India and diversification policies. In other words, the US has much to lose if it imposes CAATSA on India. Besides, it will be a huge set back to the emerging defence and security cooperation that has led to India signing a logistics pact with the US, American arms deals with India booming from near zero to over $15 billion in a matter of less than a decade, the US designating India as a Major Defence Partner, and both countries actively cooperating in various security forums including in the newly formed Quad. Given this, and the fact that Russian weapons in Indian hands do not threaten American national security interests directly, it will be extremely unwise on the part of the US to impose any CAATSA-related sanctions, least of all its two most stringent ones related to export control and equity/debt investment, on India. While CAATSA is unlikely to be imposed on India anytime soon, it is nonetheless a dampener on an otherwise booming defence relationship between India and the United States. As a sovereign country, India cannot be dictated to go slow or suspend its existing or future defence cooperation with Russia. It is also practically impossible for India to ignore Russia in view of the latter’s importance in meeting some of the critical defence hardware requirements of the Indian armed forces and also because of the overwhelming share of Russian weaponry in the Indian arms inventory, the upkeep of which necessitates New Delhi’s continued dependence on Moscow for the foreseeable future. Indian defence decision makers may like to impress this critical aspect upon their American interlocutors and find suitable mitigation. At the same time, India also needs to be prepared for any eventual CAATSA-related sanctions, which, though unlikely in the immediate future, may surface in the long run. India may safeguard its interests by expanding the scope of its existing guidelines for penalties in business dealings to include a provision for banning defence companies of countries which resort to banning entities of other countries for foreign policy purposes. Moreover, India may also like to be cautious while issuing multi-billion dollar arms tenders to countries that are perceived to be unreliable. 10. Shyam Saran, How India Sees the World: Kautilya to the 21st Century, Juggernaut: New Delhi, 2017, p. 215. 12. TIV is a statistical unit used by the SIPRI to measure the “volume of international arms transfer of conventional arms.” It is “based on the known unit production costs of a core set of weapons and is intended to represent the transfer of military resources rather than the financial value of the transfer.” See https://www.sipri.org/databases/armstransfers/sources-and-methods. It may, however, be noted that as an indicator of arms trade, especially with respect to India, SIPRI’s data is debatable. As an example, according to the Indian government, the cost of a Rafale fighter is Rs 607 crore (~$100 million) and that of a SU-30MKI is less than $35 million, while SIPRI’s TIV is 55 million for both. More importantly, SIPRI includes Hindustan Aeronautics Ltd’s licence production of SU-30MKI and Ordnance Factory Board’s licence production of T-90 tank as part of its trade data. For a critique of SIPRI’s TIV, see G. Balachandran, “International Arms Transfers: A Study”, in Jasjit Singh (ed. 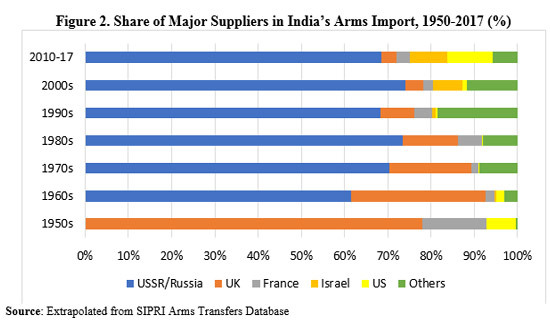 ), Conventional Arms Transfers, New Delhi: Institute for Defence Studies and Analysis, 1995, pp. 48–59.